Gifts. I love giving them, but I always wonder if I have found just the right gift for that special someone. Some people are really hard to gift shop for, and it can be a challenge. There are times that the perfect gift may not be found in a wrapped package. This is why I was excited that Breakaway Experiences asked me to review an experience from their directory of businesses that provide amazing experiences anyone would enjoy! I chose Location, selected my province, and from there, I browsed through all of the experiences listed to choose from. Since I have always wanted to do a cooking class, I decided to try the Hands-On Cooking Class with The Urban Element. I added it to “My Cart” and went to the Checkout to finalize payment. 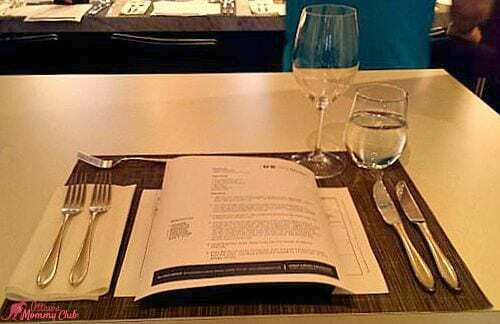 I was sent an email with the details of my experience, as well as instructions how to contact The Urban Element to select the cooking class of my choice. Once I visited website for The Urban Element for the classes they offered, I thought I would enjoy trying out their Summer Harvest class. When I called to book my class, they were able to answer all of the questions I had about the class as well as any concerns I had. I was even sent an email to confirm my class and to ask about any food allergies I may have to make sure I could fully participate in the class. 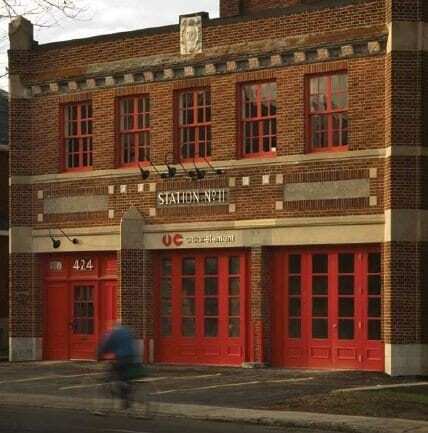 The Urban Element is located in a gorgeous refurbished firehouse in the Wellington West area of Ottawa. They provide various types of events such as cooking classes, corporate team building events, private events, weddings, culinary consulting and UE on campus sessions, and catering services. The class then separated themselves and got to work. I chose to roll up my sleeves and help to prepare the Cornish hens and swiss chard. My partner for the evening, Ophelia, and I had a fun time navigating ourselves through the menu set out at our station. I loved that each menu was only a page long, and that there was a list of equipment provided so that if you were to try and duplicate your efforts at home, you would know what you needed before you started cooking. Luckily, the cooking instructors had previously prepared each station with what we needed. One of the best parts of prepping the Cornish hens was separating them so that they were in quarters. I picked up a lot of handy tips to take along with me on future cooking adventures in my own kitchen. Chef Rajan and the cooking instructors were also on hand to give any further instruction and to answer questions we had about our part of the menu. From prep to the end of your meal, each class is three hours long, and boy, did time fly while Ophelia and I had our adventures in this gorgeous kitchen. Once we finished preparing our part of the meal, Chef Rajan and the cooking instructors then put all of the pieces of our meal together and served us 4 amazing courses! We were also given our choice of a wine (white, red or rosé) to sip on while we enjoyed each course. Though I helped prepare the Cornish hen, my favourite course was dessert. 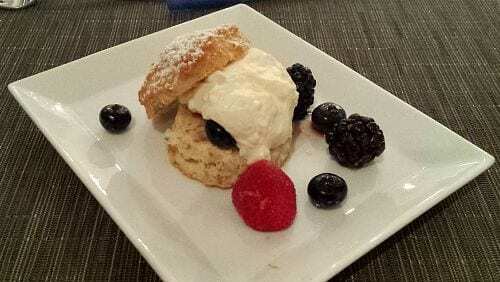 The Mixed Berry Shortcake with Limoncello Mascarpone Cream was divine! I could have had seconds (or thirds), it was THAT good! If I had one criticism about this experience, it would be that I did not get to try and make all of the courses for that particular class. I understand that the class is structured to have students make a part of the meal for time constraints, but it would have been fun to try my hand at some of the other courses. As I left for the night, I was so happy and excited by this cooking class at The Urban Element. Chef Rajan and the cooking instructors were really helpful and helped us with whatever questions we had about our portion of the class. 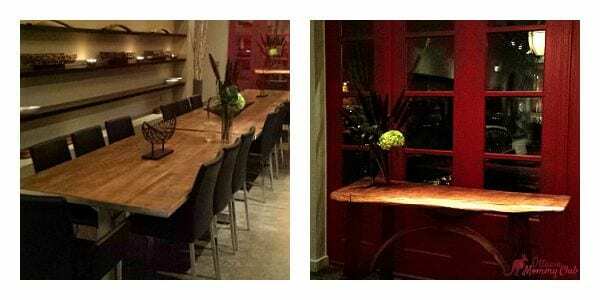 The atmosphere was fun and laid back even though the kitchen was crammed with people cooking, and the space was gorgeous to cook and enjoy your meal after the class. Oh, and the food everyone made was scrumptious! It was a great experience! I want to go back for another class with a different theme to try preparing a new dish. Gifting an experience is a great present to give to a parent, sibling, friend, or couple, and they make fabulous Christmas, birthday, anniversary, or wedding presents! For more information about The Urban Element, you can visit their website, Facebook and Instagram pages! To learn more about Breakaway Experiences, you can connect with them online, as well as on their Facebook, Twitter, Pinterest and Google+ pages! Disclaimer: My experience was paid for by Breakaway Experiences in order to write this review. My views are all my own. Breakaway Experience would like for one lucky Ottawa Mommy Club reader to have an experience of their own! We are giving away a $100 Gift Card from Breakaway Experiences to put towards a fun and exciting adventure of your choice! This giveaway is open to Canadian residents and ends at 11:59 EDT on December 12th, 2015. I would choose the Ottawa dining experience. I would choose the Stock Car Driving Experience, Medicine Hat Speedway. I’d do the zipline in Whistler, BC. I’d love to go on the The Lost Souls of Gastown Walking Tour. The biplane flight sounds pretty cool! High tea spa at the upkeep shoppe looks great!! I would pick the dining experience. I’d love to do the Distillery District Segway Tour or the Sailing 🙂 How cool!! I would choose the Lady’s Spa Day at Novo Spa in Toronto! The ottawa brewery tour looks pretty great to me! The Offroad Scenic Hummer Adventure would be awesome fun! I think I would choose the Superfly Ziplines experience at Whistler – we always talk about going to do this, the gift certificate would help make it a reality! I would pick the Dark Table – Dinner for 2. Totally would pick that one. I would choose the spa experience at Holtz or any spa!! The heli ride above the gatineau’s would be beautiful this time of year. It’s a tough choice, but I think I’d choose the Kensington Market Sweets Tour. I love the idea of a foodie tour. There really isn’t that I would be interested in for the Calgary area at all, so if I was lucky enough to win I would give this to my Mom. She’s in Victoria and there are some great things there she would be interested in. Maybe the carriage ride for 4 or craft beer & culinary tour! Thanks for the chance. I would choose the Dinner in the Dark! I’d choose the Camp Explora Electric ATV Scavenger Hunt Adventure! I would chose the Niagara’s Twenty Valley Wine and Cheese Tour. I would like to do the lady’s spa day at Novo Spa in Toronto! Definitely the Introductory Flight Experience – Sea to Sky Air! I would do the zipline in Whistler, BC. I would choose the Whistler dinner tour. Brewery Tour – Ottawa my husband would like this! Distillery District Segway Haunted Tour sounds like fun. Love the variety in offerings. I’d get dinner for 2 at the Fish Market (breakawayexperiences.com/en/the-fish-market-restaurant-dinner-for-2-with-wine). 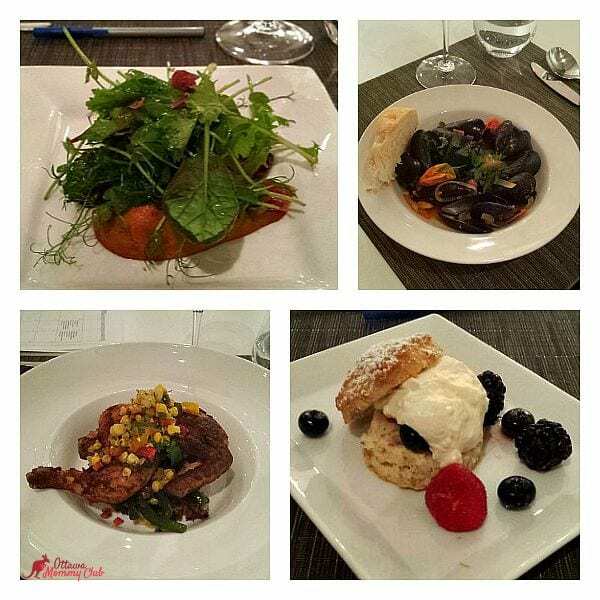 I would choose the Coasters Seafood Grill – Dinner for 2 with Wine experience. The kayak lessons would be a lot of fun! There is only one available in Atlantic provinces, Scotia Speedworld. I would love white water rafting. The Biplane Flight Over the Gatineau Hills for 2.